Update: Our apologies for our site being down for most of the day. Wow, we did it! Or should we say Merlin did it. It’s not every day a cat reaches the BIG 2-0. Merlin turns 20 officially on Oct. 2 but we’re celebrating Merlin Week all week. This is Merlin at 8 weeks and for almost twenty years he’s given me more fun, more joy than I could have ever predicted. 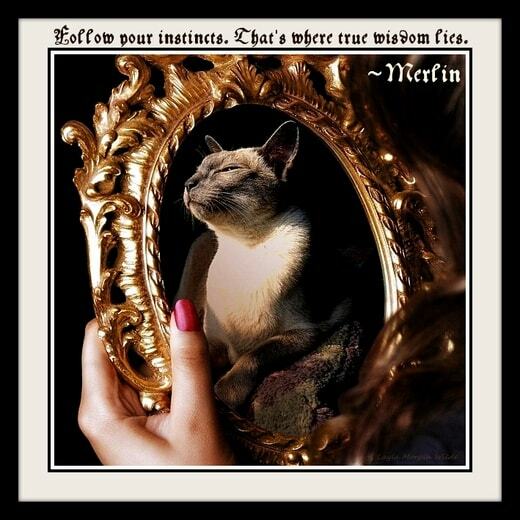 Never wild or kittenish, Merlin exuded a wise, Buddha nature from an early age radiating benevolence and charisma. Everyone who met him fell under his spell. He was my teaching assistant and gracious host ushering guests, clients and students up and down stairs, to and from the front door. His gregarious nature extended to the feral colony I fed in the backyard and when I launched the Annex Cat Rescue, he become the mascot. Volunteers would sit in my living room making catnip toys to sell with Merlin snooperverising their handiwork. Advocating for the less fortunate has always come naturally to him. I’m lucky to have a few of his kitten pics but I didn’t meet him until he was 9 months old and not neutered yet. 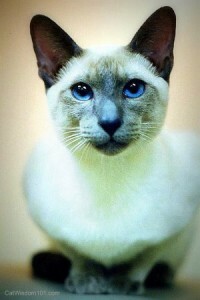 His wise, old soul spoke through his enormous blue eyes. I felt an immediate connection but circumstances prevented my adoption of him and his sister Coco. On Oct. 1, 1995, on the eve of their first birthday they arrived from a shelter. We’ve rarely been apart and Merlin was a devoted brother to Coco until she passed in Sept. 2010. Merlin began blogging at Mancat Mondays and Mondays with Merlin on May 30, 2011. Dispensing his sly wit and wisdom in words, images and quotes, he’s racked up over 200 posts. This was his first post and photo quote. What better way to begin the week than wisdom from Merlin, the wise old boy himself? Like a fine wine or cheese, he keeps getting better with age. Merlin had indeed ripened with age and continues to inspire me every day and hopefully some of our readers, like you! We’ll be doing crowdfunding for 20 days in honor of Merlin’s 20 years. If you can contribute, please do. If not, will you consider sharing? We’ll have donation widgets on all our social media pages. You’re gettin’ a whole week for your birthday? EXCELLENT! HAPPY BIRTHDAY MERLIN! May your week be filled with love & cuddles and treats & nip. Lots & lots & LOTS of the nip! 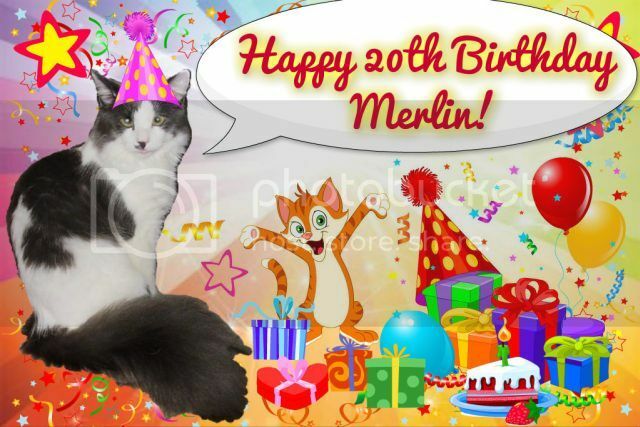 Happy Happy Happy 20th Birthday Merlin!! Sorry about the two Comments!! 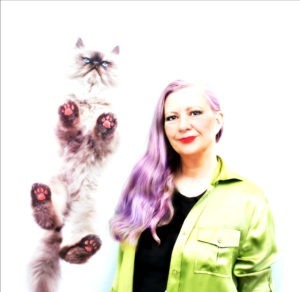 A purry happy birthday to you! Simplee amazin Merlin did ya nose dat 20 kitteh yeerz eequallz 96 in Hu’man yeerz??? Mousiez ya IZ Boo-daa fer shure! Me Mum sendz her green papurrz to our Feral Kitteh n TNR here so we do diz fer ya cause yer an addvokat fer dem what cannot speek fer demselvez!! We also feedz to feralz on our patio..plus Mum doez stray resckue wif me Aunti n Unckle…we triez to spread guud werdz dat ebery bit we do doez help a kitteh in need!!! Happy Birfday Merlin!!!! Ya rock totallee..
We voter our youngest, Einstein, to sing your honors! Dear Dear Friend,we celebrate each new day with you and are so happy to have them . We will most assuredly make a donation in your honor noble Sir. We wish you all the glory and peace that is possibly for the rest of your well lived life however long it may be (we’re rootin fur another 20) Thank you kind sir for sharing all of your wisdom and insight. Meowy 20th Birthday Wise and Wonderful Merlin! What a great week it will be!! I’m so happy you bounced back, what an inspiration. That’s incredible and wonderful, Happy Birthday from all of us! Happy birthday, Merlin!!! You are one extra special boy! Woweeeeee – Merlin you had us worried. It is SO GOOD to see you at 20. Well done Mate, well done indeed – we are proud to know you and your Mum and to cheer on a cat who at 20 is one of the best we know. Woah!! Happy 20th, Merlin! That’s a great accomplishment! I’m hoping to do the same. i’d better, or MomFOD will be disappointed. Congrats on your amazing life and all the wonder and happiness you’ve brought to your family. Love, Crepes. Wow! 20 years! Happy 20th birthday dear Merlin. Merlin, you are a MARVEL. Our peep’s ‘versary is on the 2nd…they’ve been married one more year than you’ve been here…a very long time, Mommy says,MOL. Oh Merlin! We’re so happy you made it to this day. Happy Birthday!! Happy Meowday Merlin. Wishin’ yous a pawsum week. Merlin, felicitations on such an esteemed age! You have lived a much loved life and we’re so happy for you. Happy 2-0, Merlin!!! We’re so glad you bounced back in time to celebrate such an amazing milestone. We hope your birthday week, and every day of the year, is as special as you. We’ve enjoyed Merlin’s wise ways and look forward to spending the extra time with him this week! 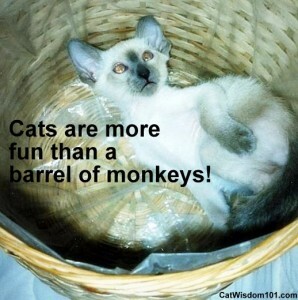 What an incredible mancat he is and I love his first picture/quote! 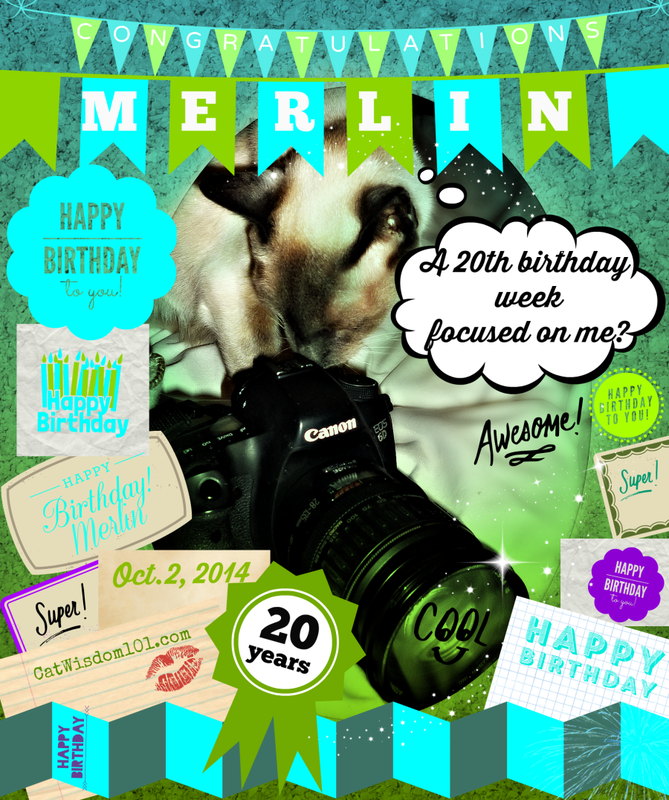 Happy 20th Birthday week Merlin. Concats on 20 years!!! We think it is great that you want to give back as part of the celebration! Oh Merlin we are so glad to be celebrating your birthday week with you. Happy Birthday Week Merlin my friend………….I am so happy you have reached this major milestone……..you know I hope and pray there are many more ahead of you and also hope I can be strong enough to make 20 myself!! We sent Mom Layla a card this morning to give to you with love from us. Happy 20th birthday Merlin. Wow, that is an amazing achievement for a kitty. Have a great week! Happy birthday, Merlin! 20 is an amazing achievement for a kitty! I know you keep staying because you know how much your human needs your wisdom and strength. Your spirit is inspiring and I hope you have more good days ahead of you. 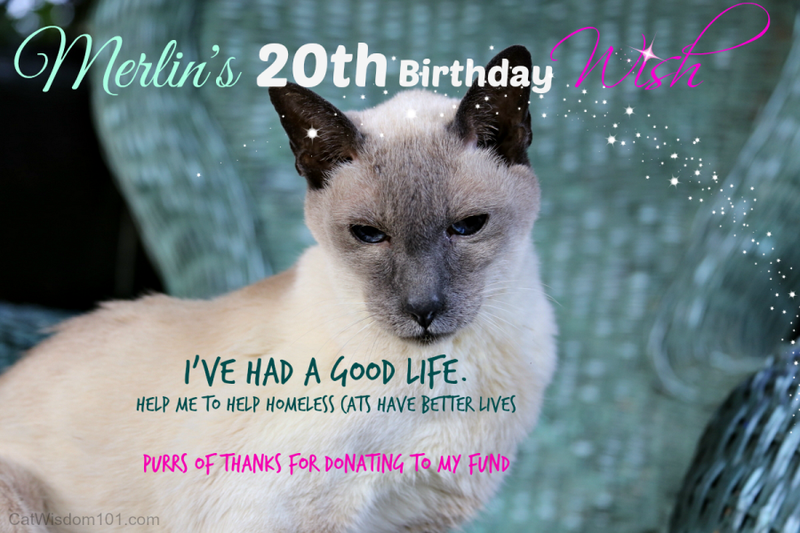 Happy Happy 20th Birthday Merlin !